The maintenance checklist for a commercial property is a long one. Outside of the cosmetic maintenance like landscape upkeep, cleaning, and paint touch-ups, there is another checklist for the structure of the building. And those are much more important than some fading paint. The roof of the commercial building is one of those things, that without proper maintenance and care, can cause big problems down the line. Look out for the common causes of roof leaks and stop problems before they start. According to data gathered in a 15-year alliance between Firestone Building Products and ProLogis, it costs an average of .14 cents per square foot to proactively maintain a roof annually, versus an average of .25 cents per square foot for annual reactive maintenance. Without proper inspection, this number goes up dramatically. So what should property managers look out for between inspections? What red flags indicate that the roof needs an inspection to make sure everything is working as it should? There are the obvious signs like a moldy smell, discolored ceiling or walls and the most obvious; water actually dripping in the building. Even if you don’t see obvious signs, keep the age of the roof in mind, the best time to stop a leak is before it starts. So now that we know what to keep a watchful eye out for, let’s get into what causes these leaks and what can happen if left without attention. Your commercial roof should never look like a swimming pool. There should never be sitting or ponding water on the roof for more than 48 hours. This water is typically caused by a poor drainage system or a poorly installed roof. When you see it, you’ll know. Ponding water can cause leaks and other issues to a roof through a variety of ways. It attracts dirt and debris that accumulates on the roof and can encourage mold growth in the roofing system as well as other water-based decay. It also has the potential to ruin your roof coating, especially when sitting in the sun. Flashings must be fastened at the top to prevent the membrane from slipping down the wall or curb, or to keep the membrane from creating a funnel into the building. The perimeter flashing can be found where the roof meets an exterior wall. This flashing is the roof’s first line of defense against wind and water damage. Without proper installation, or if damaged, perimeter flashing can come loose, detach, and cause significant leaking and roof damage. Clogged drains are not something you can ignore on your commercial roof. Think of the typical roof of a home. You have sloped sides for water to run down naturally. 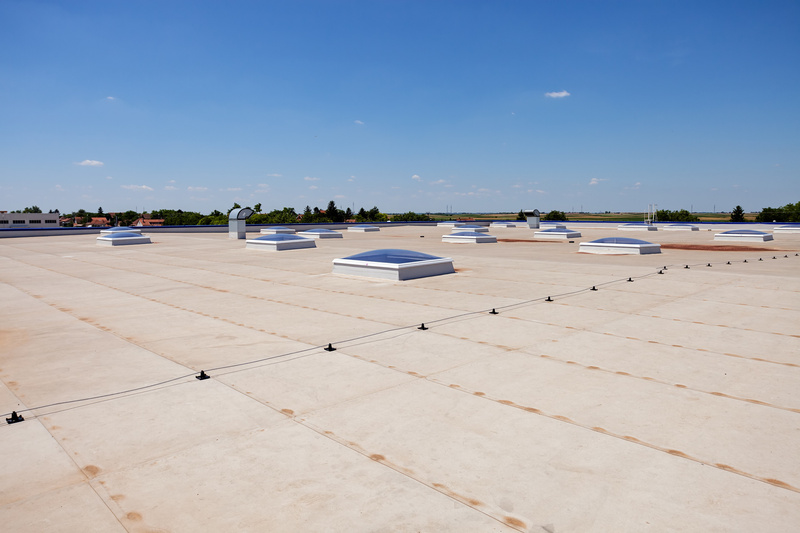 Flat top commercial roofs don’t have the benefit of gravity working to keep them dry, so drains are critical to their upkeep. Be sure to check and clear the drains, and bring in a professional if you notice consistent sitting water or slow drainage. These are just a few examples of the usual suspects when it comes to leaks in a commercial building. To ensure these, and other issues, don’t cause damage in the long term, you need regular inspections and maintenance. According to buildings.com, a well-maintained roof will last 21 years compared to 13 years with a reactive maintenance program, depending on the roofing system and building type. If you notice these or any other symptoms of roof damage, it’s time to get an inspection. Like most things in life, the sooner you address the issue, the less your potential for significant damage. Be sure to get a professional inspection to know what repairs you need. Not all damage requires a new roof, so make sure you have all the facts from an independent team before you bring on a contractor to repair or replace what might not need it.